The microKEY61 provides a full five octaves while fitting in the same horizontal space as a full-sized 49-key model. 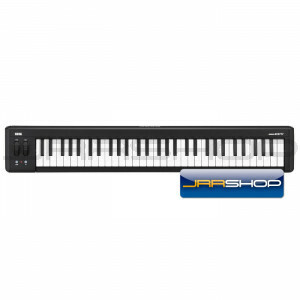 The 61-key model is ideal for use in the home studio, while still satisfying the needs of a performing musician. microKEY61 harmoniously joins hardware with software by including the "Korg Legacy Collection Special Bundle," providing software versions of five of Korg's most coveted synthesizers: the MS-20 analog monophonic synthesizer, the Polysix polyphonic synthesizer, the Mono/Poly analog synthesizer, the M1, and the Wavestation digital synthesizer, as a suite of 19 of Korg’s sought after effects plugins. The microKEY61 also serves double-duty as a USB hub. The two USB ports (Type A) allow you to expand your custom control center by adding on a Korg nanoPAD2 or nanoKONTROL2 – or any other USB device.